So this January I am delving back into painting. Its a challenge and I am embracing it! Honestly this isn’t all my own plan, my mum has asked for some new paintings as she has just redecorated and you can’t say no to your mum! I jumped right in, firstly clearing out my painting supplies (why did I keep so many paint-covered jars?!) and then started planning out what I was actually going to paint. In total there are four canvases on the go, but I needed that sense of accomplishment so chose to finish one and keep the others on pause for now. Im usually great at procrastinating, I think secretly that finishing one canvas, is really a distraction to everyone that I am ignoring the other three! 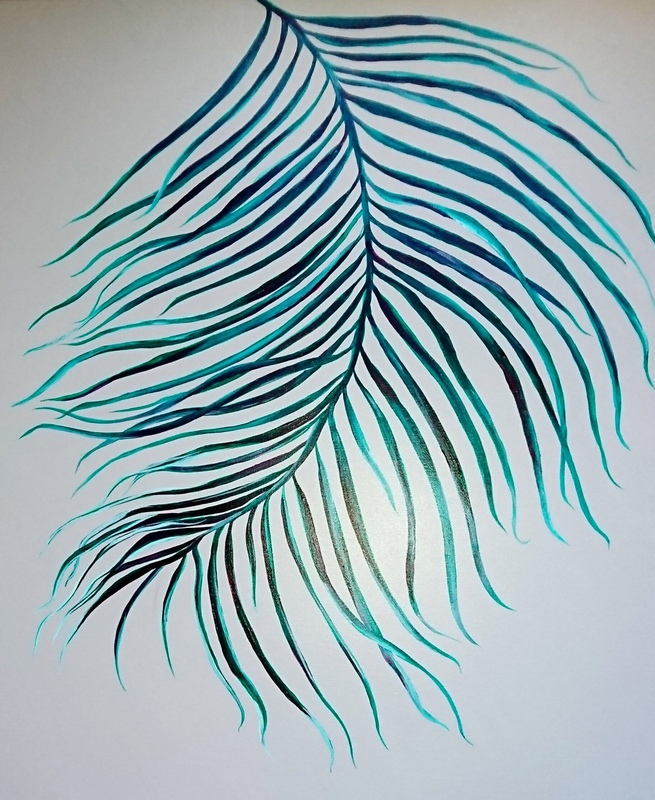 This first painting was planned out as a leaf design, I spend some time looking at tropical plants and swatching a lot of colour combinations. This painting will be calling a cream wall it’s home and we wanted to have grey incorporated into it. I mooched about on pinterest for a bit, just looking at colours textures and getting distracted by all the recipes on there… Eventually the plant theme was becoming clear and I chose to sketch out a couple of ideas. I find that keeping ideas loosely in a sketchbook is helpful when you want to look back at what you were thinking when an idea first came to you. I had planned to take out all my notes and post-its before I photographed the pages for this blog post, but something was telling me to leave them there. Now that I’m writing and editing this I think it’s because my scratchy notes show more of a progress than a neat page (I am anything but neat) and when I’m reading other blog posts or seeing someone else’s sketchbook online, I really like that ‘behind the scenes’ vibe. So back to the actual painting, we agreed on this ‘leafy theme’ I had played around with and lots of phthalo green (a favourite) I added some crimson for some darker contrast and adding white creates this lovely fresh-almost minty brightness. Am I happy? Well yeah! I haven’t painted in ages and I’m pleased with this finished piece, is it still looking nice and leafy like I planned… I’m not too sure. I’m getting a feather/peacock vibe from it now. I’m off to plan the next painting and get started on that. Do you have a creative process like me? I just can’t go at that pristine white canvas without a plan!